• Plan based on weather–rain can easily ruin a fresh coat of paint and undo hours of hard work, so weather is truly a critical component of a successful exterior paint project. • Refrain from painting when the temperature drops below 4.4°C (40°F). 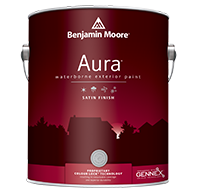 • Always reference the paint can label for additional insights on weather-related directions. Most acrylic/latex paints will work on the majority of popular exterior home surfaces, including wood siding, brick, fibre cement, stucco and EIFS (Engineered Insulation and Finish System). Favourite finishes for exteriors include low lustre or satin, as they tend to resist dirt pick-up compared to flatter finishes. Many homeowners opt for semi-gloss for that little pop of shine on the trim, shutters and mouldings. Always work from the top down, painting gutters and eaves first if you want them to match the colour of your siding. Paint trim before the main surface of the house first as well. Be prepared to apply two coats of premium exterior paint.